Email or Username Enter your email and click on "Forgot Your Password" to reset your password. These VFW Cards were shared with the Seattle Genealogical Society with the intent of making them available on our Members web site. The cards are a mix of Former Member Applications, Former Member Records, Dues Records and Receipts, and Miscellaneous records and correspondence. 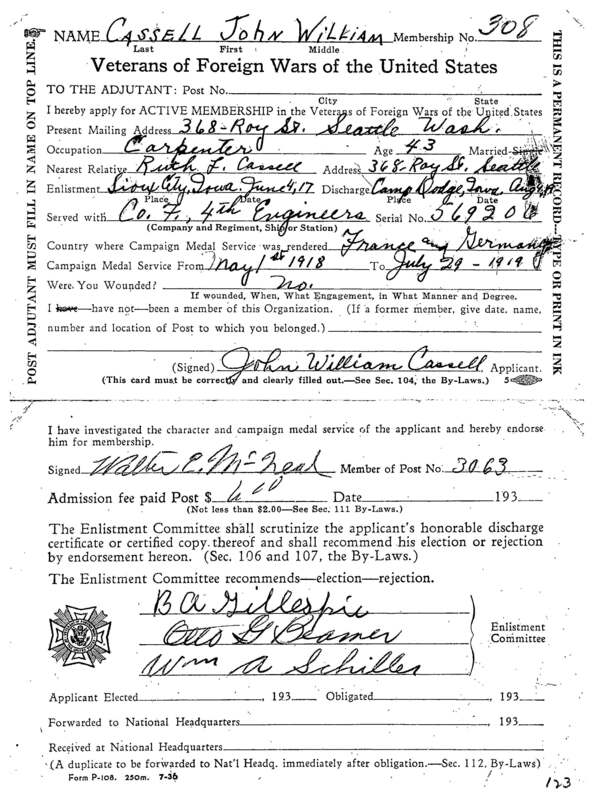 •	******NOTE New Instructions ***** ---If Veteran served in 1919 or before, mark Deceased as "Yes"
•	Not all cards have all the information for the fields in the index. Not all the information on the cards is indexed. If the information is missing or not part of the card, leave the index field blank. At a minimum enter the surname and given name of the member the item is for. •	Include Middle Name and or Initials in the Given Name field. Do not use a period after the initials. Put a space between multiple initials. •	For Post Number enter only the number. •	For Branch of Service use: Army, Navy, Marines, Air Corp/Force, Coast Guard. Do not include any unit designation in the Branch of Service field. If the Branch of Service is not stated but is obvious by the unit, fill in the Branch of Service. •	For the Birth Month use the common three letter abbreviation with no period. For the Birth Year use all four digits. •	For Birth Place use the city if shown and the current 2 letter state designation. Use a comma between city and state. •	For Birth Country spell out the country unless United States then use US or USA. •	Enter Yes in the Deceased field if the file is marked deceased and Unknown if it is not marked deceased. 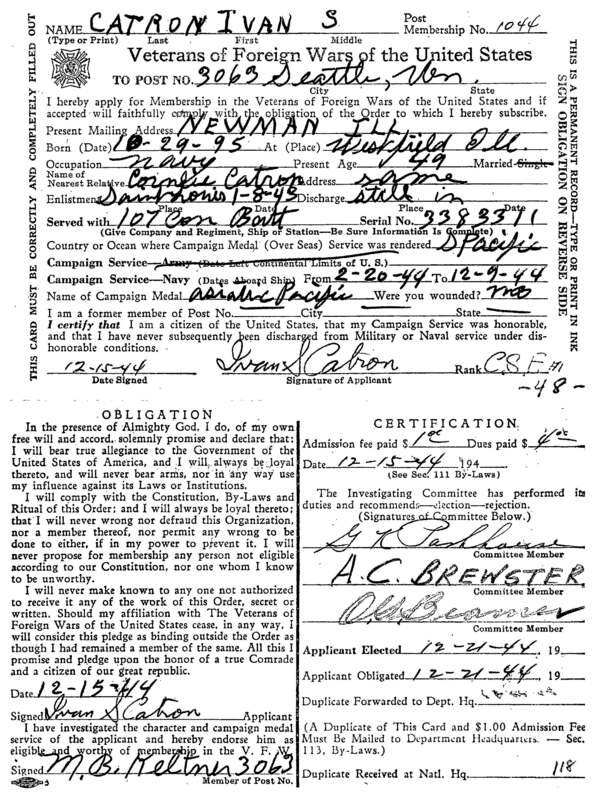 •	If Veteran served in 1919 or before, mark Deceased as "Yes"
•	Use the Remarks field for anything unusual, such as “Given Name not readable”. •	Please do not use all caps. Click Image to open as full size in another tab.